After two similar storylines, how can director John McTiernan re-invent the franchise? 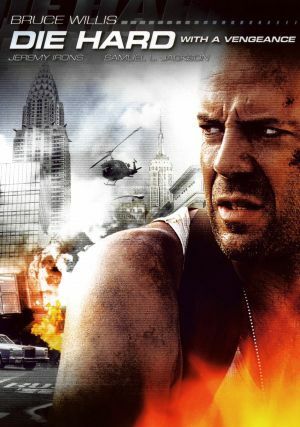 When a terrorist blows up a bank to get John McClane’s attention, he and Zeus Carver must solve a series of riddles and race across New York to prevent any more civilian casualties. Starting the story on suspension from the police force and with a hangover McClane is instantly portrayed as a carefree cop who still plays by his own rules. Not delving any further in to McClane’s recent exploits allows the main story to progress quickly, jumping swiftly into all-important storyline and action like McClane arguing with the anonymous villain with McClane attitude that we’ve come to expect. This thankfully side steps any tedious re-cap of the previous film, while still providing valuable information on our hero. A successful new addition to the franchise is the largely faceless and unknown villain, who proves to be a vast improvement on Die Hard: 2′s Colonel Sadler. Further more, the baddies’ links with previous films build a much more effective villainous role with better motives. Much like the first film, the European villainous squadron creates clearly defined sides with American patriots against the outside invading world. All of this combined ups the ante on the baddies, creating much needed effective foe for the two American patriots, McClane and Carver. Creating a new plot is essential to the third film in this series, especially following Die Hard 2′s similar set up to the original. This can be attributed to the return of Die Hard’s director, John McTiernan, who manages to create an appealing and interesting new story for McClane and co; the film doesn’t stagnate despite using more locations than before as well as the addition of a sidekick. Even though the second film was a great watch it’s certain that a change was needed to keep interest while gaining new fans for the franchise. Die Hard: With a Vengeance improves on its predecessor, mainly with it’s gripping plot, unnerving baddie and McClane’s new friend, Zeus. These three elements combined generate a strong drive for McClane to defeat the terrorists, creating a thoroughly enjoyable film to become the best of the series so far.